Atelier Visconti brings us the sophisticated “Vincent”! 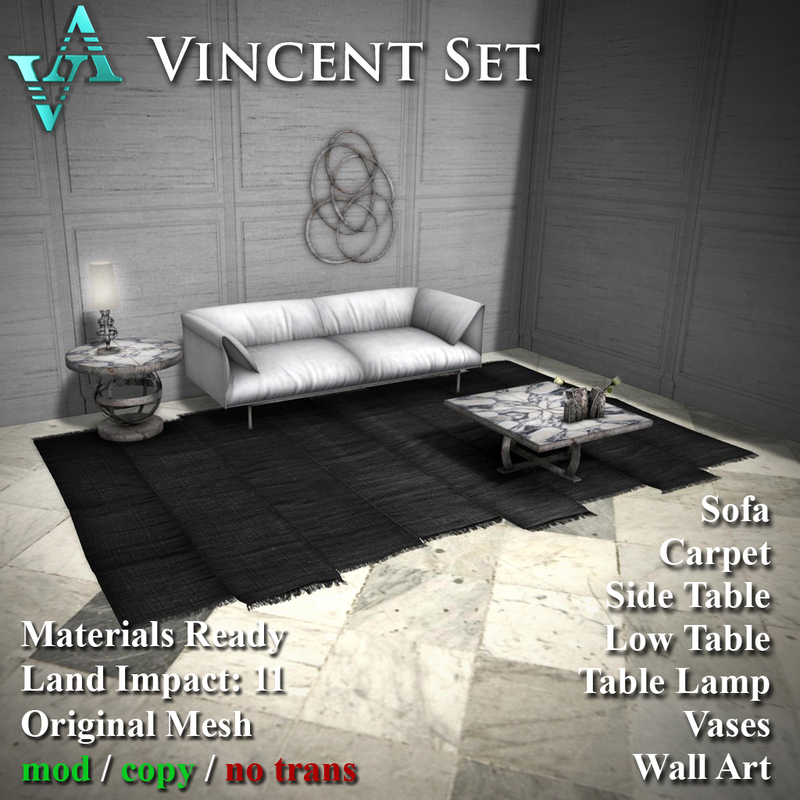 Vincent is a gorgeous, modern looking set, that has a hud controlled sofa and carpet. 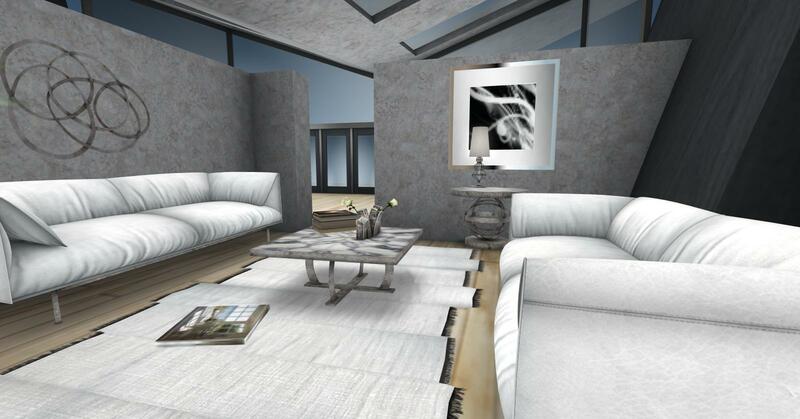 The hud offers you a selection of six neutral colors, on each, that will fit into any decor scheme! 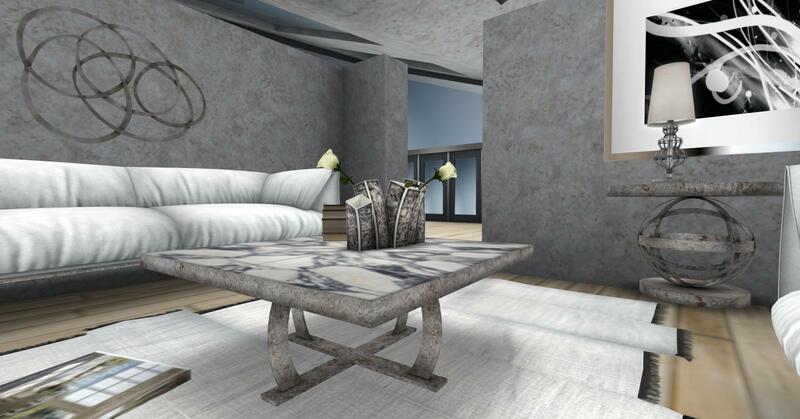 The amazing tables are marble, with a beautiful veining pattern, upon a stone base. The Circle Wall Art, will make quite the statement upon your walls! The Vincent includes the sofa, side table, low table, table lamp, carpet, vase, and Circle Wall Art. Wouldn’t you agree, it looks FABULOUS in my new home! The stylized lines of the Vincent will add a elegantly sleek, trendy, fashion forward look, to any room you place it in! 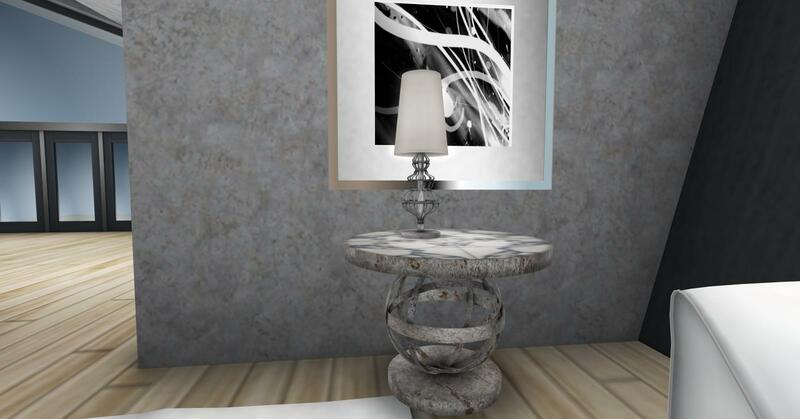 The Vincent, by Atelier Visconti, is available, this round, at the Garden located at The Liaison Collaborative. 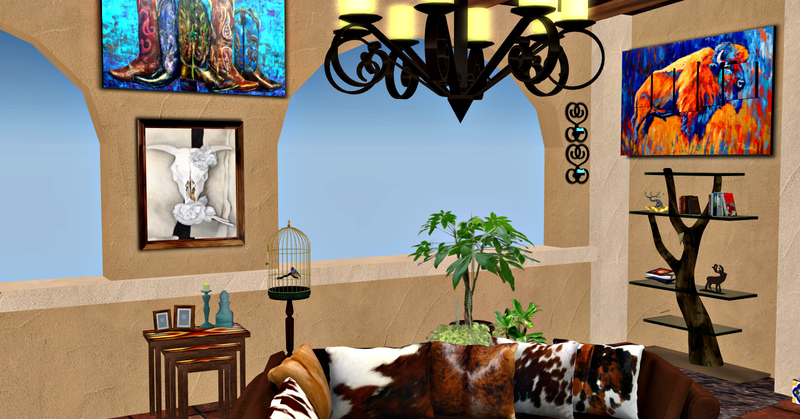 Cattlemen is a stylish new collection of western/ranch style furniture by the very talented designer and creator, Kyra Ishtari, owner of Serendipity Designs. Who said rustic has to be boring! 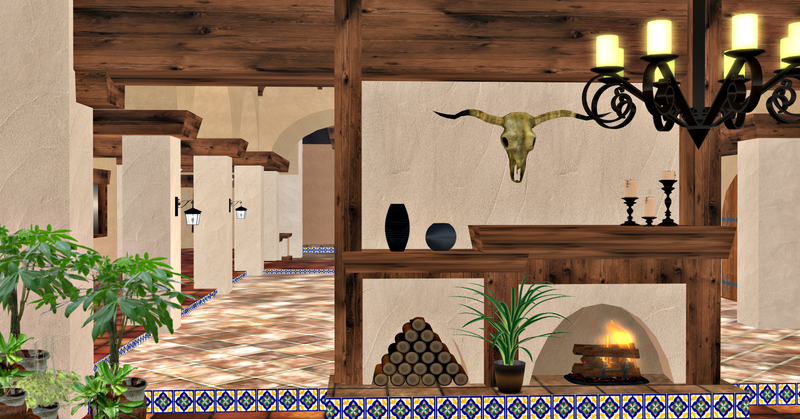 This collection brings the romance to western/ranch design, that will give any room you place it in instant panache, whether that room is located in a Second Life chic mansion, ranch, apartment or hacienda! It will draw you into its allure. Luxurious, romantic, casual sophistication are words that come to mind when I look at her collection that has been used to furnished this casual family gathering room. From the overhead iron chandelier to the tiniest knick knack horse on the console, it all adds to the amazing drama of the room. The 5 Point Buck Heads on the wall, over the awesome Taos Console Tables, gives a perfect masculine feel to the room that just adds to the ambience and overall appeal of being in this fabulous space! You just want to come in and make yourself comfortable and have that Apple Martini with the same style and comfort of drinking Johnny Walker, Blue Label, of course! As you look around at the various furnishing in the room, your eyes naturally gravitate to The Cattlemen’s Sofa that just begs you to sit upon it and stroke the amazing rawhide pillows.The sofa is a multi sit menu with great seating poses. The chocolate brown color of the sofa will hide any sins your SL children may do it! Under the couch you see the splendid Argentinian Patchwork Rug. Doesn’t, this rug, look just unbelievable under the couch! The gift from nature of the gorgeous wood trunk table will have you marveling at the beauty and graining of this naturally beautiful, hand crafted, high polished, table. The obvious pride that Kyra has taken in her designs is very evident! 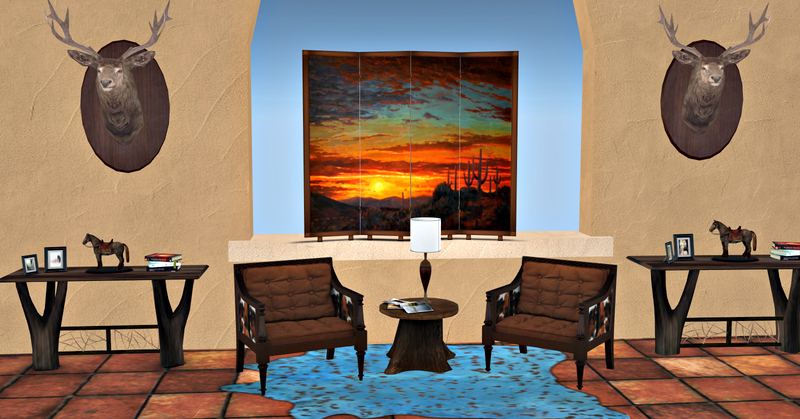 The Cattlemen’s spectacular Club Chairs, End Table, Western Room Divider, and Taos Blue Cow Rug, provides an incredible area for a tête-tête or those earlier drinks we mentioned, while you enjoy your down time. 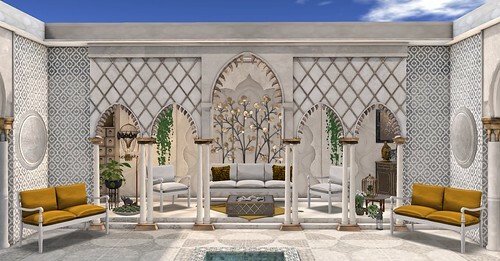 The little details and interest, that have been incorporated into her designs displays, her desire, that she want your second life abode to seem just like home! 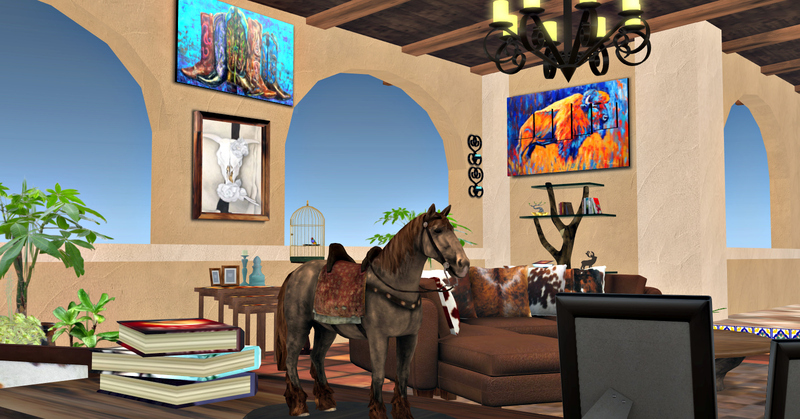 As you pan around the room, you see the stunning art work on the walls, such as Boots in Blue, Skulls and Calico Roses Print, and Bison at Sunset. 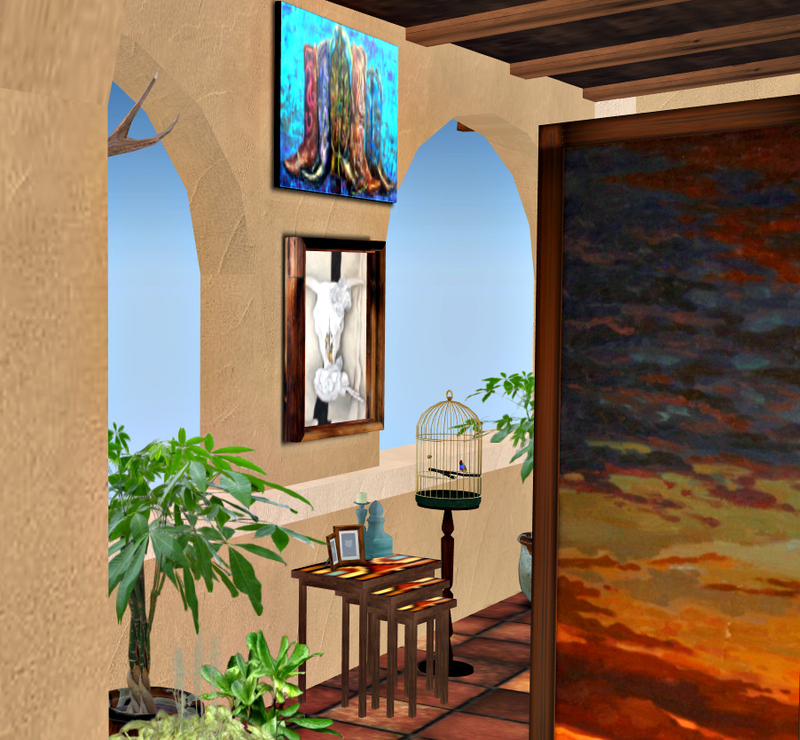 They provide the pop of color in the space that adorns the adobe walls of the Santa Fe Home. The Southwest Inlaid Nesting Tables are perfectly placed under the Calico Roses Print, bringing color and shape to that area. Next to the nesting tables you see and hear the Singing Finch. Who doesn’t enjoy the sound of birds chirping away! 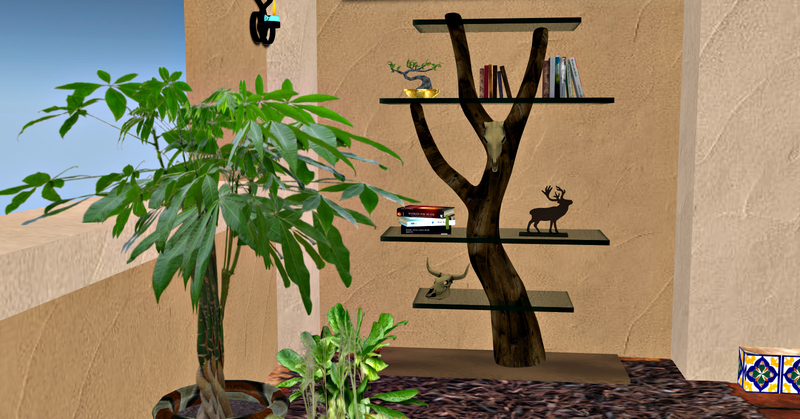 At the other end of the room, you will find the high quality and handcrafted Cattlemen’s Collection Shelves that displays various what nots and books on it. It has been accented with dried steer skulls, (my camera couldn’t get them to rezz, no matter what I tried. Gotta love Second life!). Placed under the shelves is the Leather Shag Rug. I just want to curl up on it and twirl the little shag pieces between my fingers, smiling! I took a separate shot of them really up close so you can see the details. Upon the back walls of the room, I placed the really nice black Shabby LaLa Candle Sconces. I just love her accents pieces! 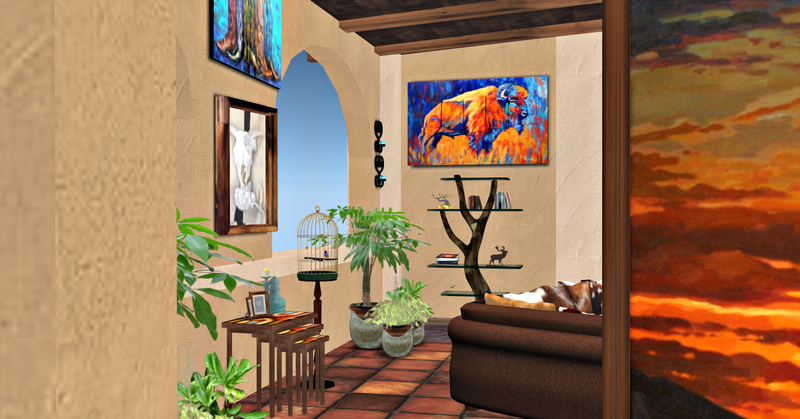 In the room you see the Three Houseplant Set and the Tropical House Plant. Plants add life to a space and is a great decorating accessory and I couldn’t resist adding them into this decor! 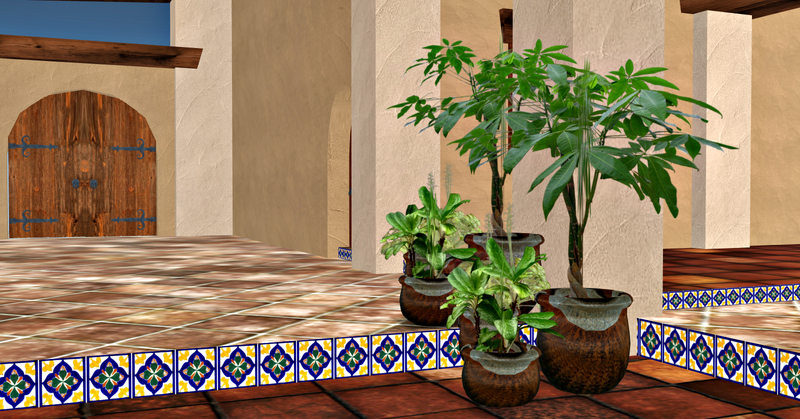 I just had to include a shot of the striking fireplace that I placed a plant on! Its a just too beautiful not to have a picture of. It is part of the Santa Fe Home. Handing you your favorite drink, I hope you have enjoyed your visit! 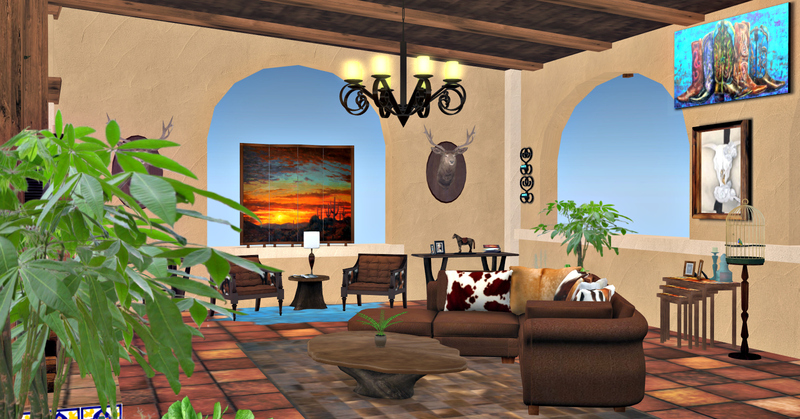 Everything you see in the pictures, including the Santa Fe House, are from Serendipity Designs! Ya’ll come on out and pay her a visit now, ya hear!